This collection is designed to inspire and sustain activists and others who are working for a better world. Shick draws on his four decades of activist experience to offer motivation and encouragement to those just starting out as well as reflections and insights to veteran justice-seekers. Brimming with poignant and inspirational quotations and verse from Jesus to Shakespeare to Edna St. Vincent Millay, Rachel Carson and Maya Angelou. 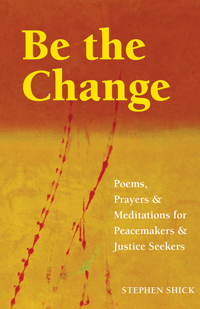 Click here for "Be the change" as excerpted in UU World. "Steve has drawn from his own richly lived tapestry of spirituality and activism to give us a gift that can soothe, inspire, gently provoke or lead us to contemplation. Be the Change will be at my side for years to come." "Stephen Shick has given activists, trouble-makers, and prophetic freedom fighters a thoughtfully crafted gift. We know the best boat in a storm is one with a good keel. That's why we who are committed to creating a just and peaceful world must tend to our spiritual wellsprings." "Steve Schick's Be the Change is a rich resource for social activists who change the world because they change themselves in the process. In a varied collection of short readings, meditations and personal vignettes, Schick effectively links the spiritual and the social, love and justice. He explores many of the dilemmas faced by those who would change the world. Drawing on resources from a variety of cultures, Schick captures the essence of the linkage of spiritual growth and social change. Be the Change would be a valuable addition to any activists library"